It has been a bit hectic around here, but I have a few moments to update my blog. First let me thank you for reading my blog. I would sure like some comments to liven things up around here. Please, leave your comments, thoughts and/or opinions. So, you want to get geared up, but you are running a little short of cash. No where in the rule book does it say you need to buy all of your gear. If fact, it is in your best interest to be able to build at least some of your gear. With simple tools, such as a bench grinder, a drill and some emery cloth you can build a serviceable knife. With a sewing machine, scissors and fabric you can build packs, gear vests, scabbards, knife sheaths and even clothing. With a wire welder, welding helmet, chipping hammer, angle grinder and some metal you will be in a position to build or modify items for your vehicle or gear trailer. With a saw, cordless drill, drill bits and screwdriver bit and some 3/4" plywood you can build chuck boxes or gear boxes to organize and protect your gear. Building your own gear has its advantages. The biggest advantage is the gear fits your needs. 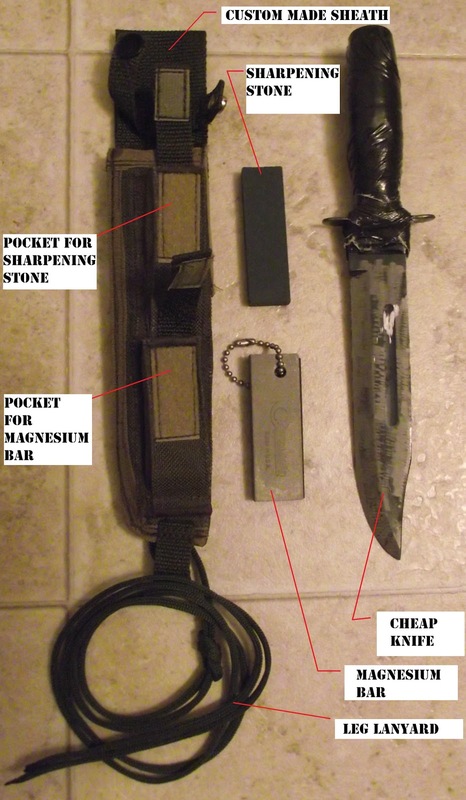 You need a sheath for your homemade knife, then you build a sheath that fits your knife. You need a roof rack to fit your 1965 Bronco, you build a roof rack to fit your Bronco. The largest factor in building your own get is your time. If you have the time, building your own gear is no problem. The stumble comes when you have a need or mission that is time sensitive and you do not have the time to do your own work. Then you must either pony up the cash to buy it from a store or have it built for you. I personally do not enjoy making clothing. It is usually too damn finicky for me. However, I enjoy making custom gear vests. I think of them as mission specific packs, not as a clothing item. The vest to the left in digital desert camo, is designed to hold the essentials for a M-1 Carbine. This vest will hold 3x 15 round M-1 Carbine magazines in the 3 pouches on the upper rightside (as you wear the vest.) As well as, 3x 30 round M-1 Carbine magazines in the 3 pouches on the lower rightside. The pouches on the leftside (as you wear the vest) hold things like a folding Gerber Paraframe 1 knife, a magnesium fire starter, a first aid kit, compass, gloves, multi-tool and a small GMRS radio. You will notice the upper right shoulder is free of pockets or pouches so you can shoot with the vest on. This vest took about 2 days to build in my spare time. Now I just need to track down an M-1 Carbine. Other gear can be modified or purchased surplus to fit your needs. This old Canadian Forces winter parka is a good case in point. With the newer Gore-tex parkas on the market, the value of old school gear has dropped. Not that the gear is any less valuable, but the demand is not there like it was in the early 1990's. So, if you are a frugal shopper, keep an eye on army surplus stores - they may have the answer to your problem of good gear for less cash. As you may notice this parka is pre-loaded with winter gear. I highly suggest this practice. In a crisis, if all you grabbed as you fled your stalled vehicle was you personal weapon and your parka that is pre-filled like the one shown you will have an above average chance of survival in winter conditions. I am assuming you have adequate clothing/footwear for the winter climate and a knife on your belt. Grab and go! Speaking of Grab and Go! Maybe next time I will speak about bugout bags and escape packs. Til then, keep your powder dry and your toque on! !